Superabsorbent polymers (SAP) are polymers that can absorb and retain large quantities of liquids relative to their own mass, without dissolving. They are cross-linked polyacrylates obtained by free radical polymerization of acrylic acid in the presence of a cross-linking agent. Therefore, these polymers are totally issued from petrochemistry. Valagro developed a 100% biobased SAP by polymerizing itaconic acid (a biobased monomer obtained by biotechnological processes) in the presence of a di-itaconate. 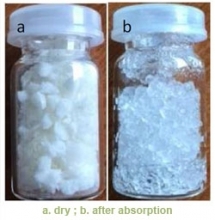 This cross-linked polymer has high aqueous liquid absorption capacity (40-50 g of water absorbed per gram of SAP, 15-20g of urine per gram of SAP; ...) and can effectively replace crosslinked polyacrylic acid. -	nutrient solutions for soil or plants.